The house sits in a field, at the top of a gentle rise. The new kitchen fills in the space between the main building and the shed. Its wall of windows has a contemporary feel, while its proportions connect to the older structure. 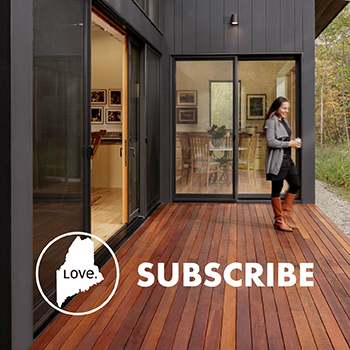 Bald Rock Builders of Lincolnville made seamless transitions between the original house and the addition. 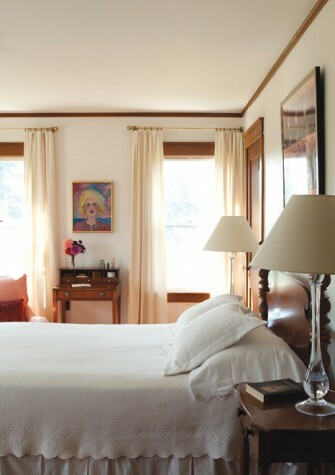 In a guest room, a self-portrait of Sherry Miller, a childhood friend of Daniels and an artist who has worked in Maine and California, hangs over a small antique writing desk. 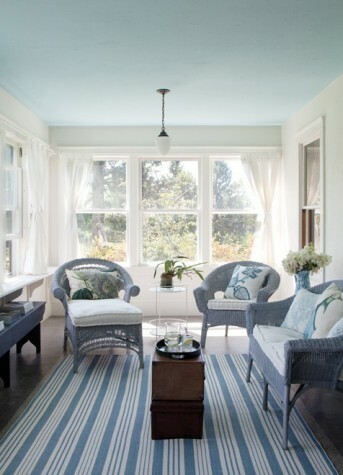 On the enclosed front porch, Daniels painted the white wicker furniture a blue-gray that suggests the lightness of summer but does not seem jarring in February. 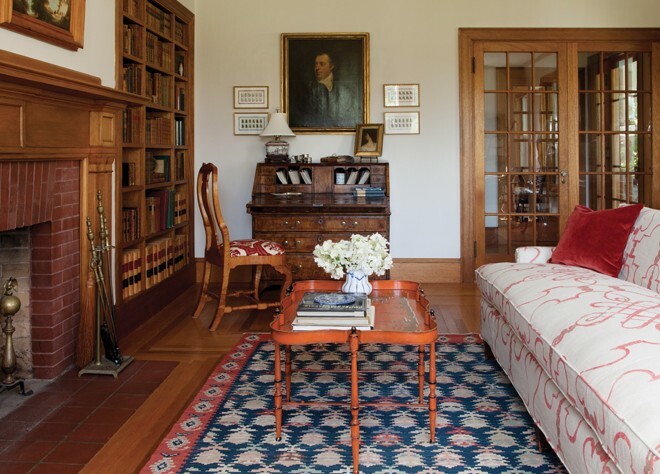 Stacked antique chests on the striped rug add weight to the pale color scheme. 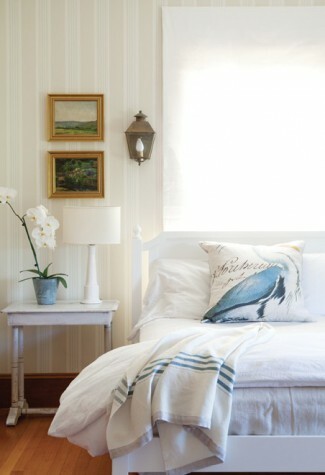 Two small French nature studies hang in the airy guest room. The sconces, original to the 1930s house, were moved here during the renovation. 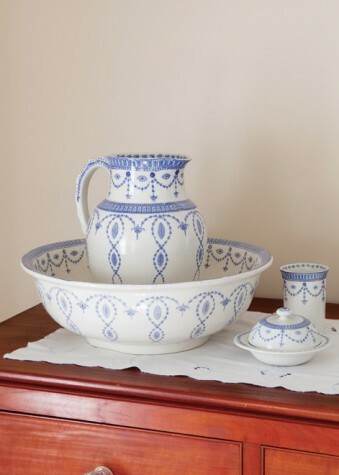 In the master bedroom, a basin and pitcher stand ready to use, as Daniels says, “when the pipes freeze”—insurance against that unlikely event. 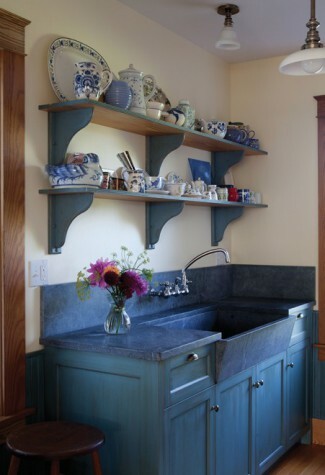 Blue and white accents appear throughout the house on ceramics, on upholstery, in color schemes. “I’m a sucker for blue and white,” she explains. 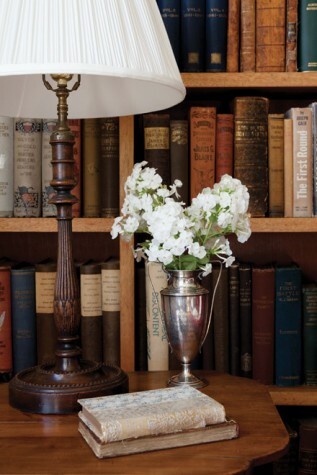 On the dining area shelves, books alternate with works of art and elegant vignettes, including a sculpture by Stacey Glassman and a painting of a woman that echoes the figure on an Italian vase. The cabinet wall, built by Dean Gardner, the harvest table, and the unmatched chairs connect the new space with the existing house. Every year for 15 years for her birthday, Lee Webb gave his wife a first edition of a book by Edith Wharton. 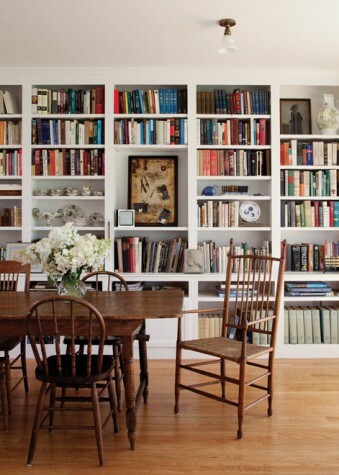 In the living room, Judith Daniels’s books share shelf space with her husband’s collection of leather-bound classics and eighteenth- and nineteenth-century Greek and Roman dictionaries and grammars. 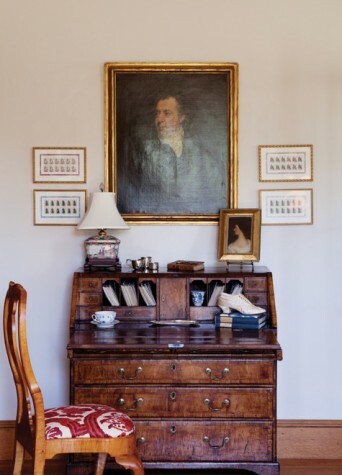 Daniels bought the English eighteenth-century desk in an antique shop in Kennebunkport for her New York apartment; when she moved back to Maine, it came with her. The portrait—“he’s an adopted ancestor,” she says—is flanked by framed sheets of British stamps commemorating Jane Austen. On the sofa and chairs Ariana Fischer used large-scale printed fabrics to balance the intricate patterns of books and art. 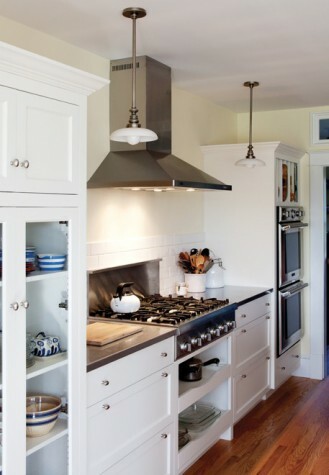 The custom kitchen cabinetry was built by Bench Dogs. A chest-high partition hides dirty dishes from guests in the dining area while permitting the cooks to participate in the party. 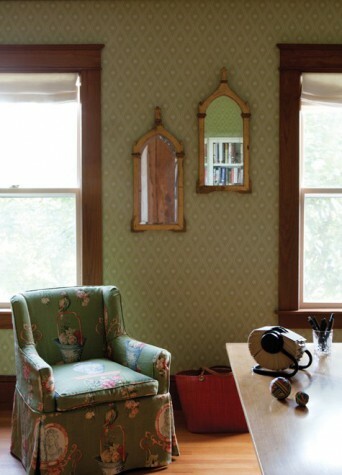 In Daniels’s study, two mirrors from her childhood home in Massachusetts hang behind the legendary Rolodex on her work table. The house sits on one of the ridges that parallel the coast, and it looks west across open fields. 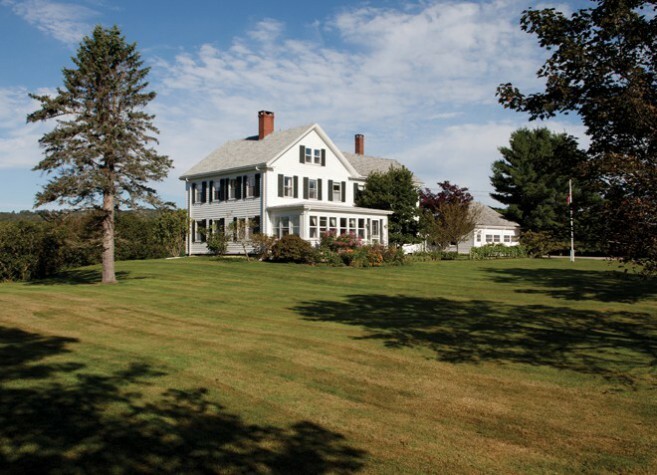 The original farmhouse, dating from the end of the eighteenth century, was the center of a 200-acre mixed dairy farm. It burned down in 1930, and within weeks, construction had begun on a replacement. The new structure followed the plans and footprint of the old one, with twentieth-century amenities and improvements, including higher ceilings and lots of built-in mahogany cabinetry—including those all-important bookcases. The firm that rebuilt it had also been responsible for the great cottages on Islesboro. 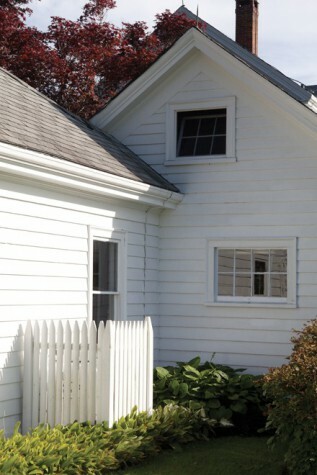 The house was sturdy and solid, with plenty of room for guests, offices, and accumulations. For several years, Daniels and Webb used the house primarily in the summer. Daniels, a legendary magazine editor, had been the first woman editor of Life, held top editorial positions at Glamour, New York, and Self, and was the founder of the pioneering women’s magazine Savvy. Webb had run two of Governor Mario Cuomo’s economic development agencies and had been an executive at New School University and Partners Health Care in Boston. Furnishing the house was easy. “As soon as we bought it, Lee’s mother sent up a truck, and my parents sent up a truck,” Daniels says. “And we began going to lots of auctions and antique shows.” Family heirlooms, random tables and chairs (15 tables and 40 chairs from Stacey Glassman’s old restaurant), sets of dishes—they had all they could use. 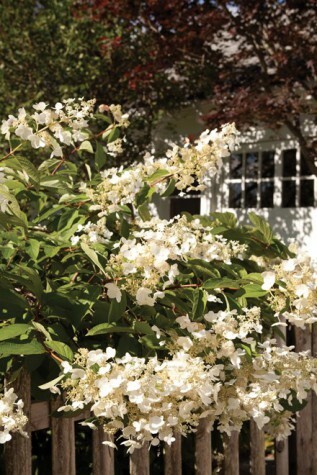 As this was the place where they retreated from city life, the hodgepodge was especially charming, a constant reminder of summer’s imperative: unstructured time. Eventually, says Daniels, “It became too hard to leave Maine. I loved the texture of daily life here. It broke my heart each time we drove away.” In 2003 they retired and moved north full-time, selling the Manhattan apartment and adding to the inherited mix in their Maine house their own elegant American antiques. Retire, however, is the opposite of what they did when they got to Maine. Webb became a senior fellow at the Margaret Chase Smith Policy Center at the University of Maine in Orono, and he is currently completing his dissertation on the political and economic history of Maine from the War of 1812 to the Civil War. He also serves on the boards of several nonprofits and is active in state politics. Daniels, too, became involved with nonprofit organizations. She serves on the board of the Maine Humanities Council and has recently completed a five-year term as chairman of the board of the Center for Maine Contemporary Art in Rockport. Soon the house’s small living room and parlor were no longer sufficient to contain their lives. It also became clear to Daniels that their eclectic mix of furniture was verging on clutter. She was continuing to collect art. She says, “I like having artwork by people I know.” At CMCA, she has gotten to know many Maine artists, and their work—including pieces by Dozier Bell, Susan Williams, and Dudley Zopp, and Nancy Glassman, Daniels’s cousin—was mingled with Webb’s maps, book, and prints. It was time to begin editing and revising—and thinking again about the purpose of the house. 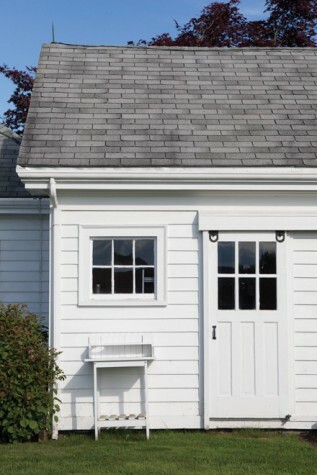 He gained space by pushing the back wall of the house out, making it flush with the shed, and then turning that wall into a wide bay, curving the windows to encompass a broader view of the fields and hills. A long harvest table from a church in western Massachusetts is set perpendicular to the windowed wall and acts as a bridge connecting the new part of the room with the existing one. The wall of windows has a contemporary feel, but the original amber mahogany cabinets act as reminders of the room’s origins. “We tied everything together with the same materials, and we went around and around—literally—on the flow for parties,” says Gross. The ample kitchen is tucked behind a high counter, on which is nailed a painting on aluminum of ice houses by Sam Cady, so that the logistics of a party remain invisible while the people cooking—often friends—can be part of a conversation. For the interiors, Daniels turned to Ariana Fischer of Ariana Fischer Interior Design in Portland. When the project was beginning, Fischer owned G.F. MacGregor, a home-furnishings store in Rockland. “I walked in,” says Daniels, “and thought: this is my taste.” She bought an old chair that Fischer had reupholstered in an oversized blue and white chinoiserie print. That chair, which is now in a downstairs sitting room, became the key to the way Daniels and Fischer worked together. Daniels, who has an infallible sense of which of her many friends will get along with each other, has a similar instinct for inanimate objects. Everywhere you look she has arranged works of art, books, and unexpected things into intriguing visual moments: a series of framed sheets of British Jane Austen stamps, for instance, or a Katherine Bradford painting of swimmers above a giant polyresin mussel shell. Fischer has balanced these small moments with oversized prints—classical heads, a fabric mural of a garden. Fischer has also helped make seamless transitions between the old and the new. In the dining room she helped work out the proportions of a wall of open shelves that makes another visual link between the 1930s cabinetwork and the new addition. Most recently, she and Daniels reconfigured a downstairs office into a sitting room and guestroom to accommodate the flow of visitors: when the couple doesn’t come to the big city, then the big city comes to them. One room retains its 25-year-old wallpaper and the other is new, but it is hard to tell which is which. For both Daniels and Webb, history is important, in its broad sense and as their personal stories. Fairview Farm holds evidence of their stories. Here, they have embraced change while retaining the precious accumulations of the past; they have built a graceful and generous expression of the affections and experiences that enrich their present. Peter T. Gross Architects, P.A.